This Website Marketing guide deals with the various ways by which you could market your business website. This guide has the unique benefit that it will be kept alive and added to as we get comments, suggestions and questions. So please provide feedback so we can improve on our guide. Another great benefit is that we will showcase plenty of practical examples so that the theory within this guide can easier be understood. The information in this guide is supplied for free. Should you wish your website to be audited along the guidlines of this guide or co managed according to the principles of this marketing guide please complete the request a quote form. SEO or Search Engine Optimisation is a marketing strategy to improve your websites presence on the internet. Allthough this strategy is discussed in detail, SEO is not the only strategy which can be employed to market your business and /or website. You can even partake in Internet Marketing without a website. There are more than 200 factors which Search Engines consider when deciding which website to present when people do a search. The aim of this guide is not to do a comprehensive guide of all these 200 factors but only to highlight those which the website owner, our typical client, have an influence over. Those factors which are relevant for the small and medium business owner. You do not need to be overly concerned with search engines like Google doing its work.Your work is to create a great informative website which surpases that of your peers in terms of available information. We will do our work and Google will do their work. We take care of the structure and technical things like meta tags and submitting your website to search engines. Buddy Web Design is a web design partnership servicing clients all over Southern Africa but mainly servicing Cape Town and the Western Cape with web-, design, development and training services. With the above information we will create the basic framework, the new website. We prefer not to do the difficult design work while our clients are watching but to spend the time with clients training only after the website has been created. We often start where traditionally other web design companies would have finished. Bot us and our new clients will study the websites of competition at the start of a a new web design project to gather ideas and a realistic benchmark of what needs to be done in order to expect business from the website. We use Kwikwap CMS software to design websites for clients. (CMS is an acronym for Content Management System) Kwikwap has been in development in South Africa for nearly the past decade by South Africans for South Africans. Kwikwap currently services approximately 5,500 small and medium businesses in Southern Africa. Importantly backup service is offered during normal South African working hours via a system of servicing consultants and a technical backup team. Francois Marais doinga n onsite CMS Website demonstration. Training on our user friendly CMS normally does not take longer than one to three one hour sessions. If all else fails we will do the updates for you at a small monthly fee. 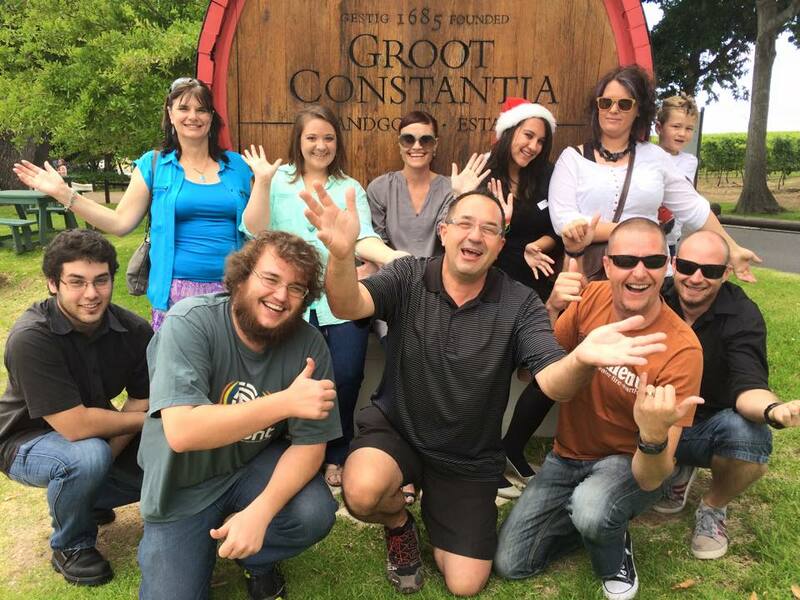 Some of the Kwikwap staff at a Social function at Groot Constantia in Cape Town. If the partners of Buddy Web Deisgn is not able to assist then one of the technical support members of Kwikwap can assist by emailing technical@kwikwap.co.za . (Always first contact Buddy Web Design to see if we could assist before emailing technical@kwikwap.co.za and please include francois@kwikwap.co.za or melanie@kwikwap.co.za when emailing technical.) Kwikwap offers support during normal South African business hours. It is good to know you are never alone in your web development process. We actively train our clients to manage their own websites. We do the more difficult once off items like the overall design and embedding various forms of media and widgets. When a website owner can manage his own website’s CMS it means he can add, edit or remove products, photographs, specials, newsletters on his website without needing assistance from a skilled webmaster. The focus of this guide is on managing the content of your website. Other tools to do Internet Marketing includes Social media like Face book and Twitter, advertising with electronic business directories. We will explain how Search Engines like Google operate, discuss other useful free resources available from Google. A copy of this guide in electronic format will be available on the website www.buddywebdesign.co.za where the guide will be complemented with You Tube videos which would make understanding the guide a little easier. This guide will be useful for any small and medium business owner who has access to a user friendly Content Management System. Time is money for any small business owner and we appreciate that most business owners do not have the time to study web design or read complex theory on how the internet works. We have tried to keep the language as plain as possible and divided this guide into the basics and then the more advanced website development sections. We purposefully use the word web development as opposed to using the word web design. The success of any Internet Marketing campaign via a website depends largely on the development of the content of the website as oppose to the initial design work involved. Web development, or more specifically content development can also be referred to as onsite SEO. This guide could easily also be called Search Engine Optimisation for small and medium businesses. This guide will assist small business website owners to appear more regularly on page 1 of Google. That is the aim of any SEO campaign. Off site SEO can refer to getting other websites linking to your website or to link your business Face book Page , your Google my business page or paid for directory listings to your website. Francois Marais of Buddy Web Design have also published a more comprehensive SEO Book and Website which can be found on www.seobook.co.za . This guide aims to be a little more concise than the SEO Book seeing that time is always an issue for small and medium business owners. A guide like this and a book on SEO has only recently become useful because the domain of web design and development used to be a very complicated and expensive affair. Quite often small businesses had to look to free offerings on the internet to have access to a CMS system. Often these CMS systems are very elementary and the fact that they are DIY becomes quite obvious. Kwikwap and Buddy Web Design have positioned themselves between the free software and the very expensive web design options available out there. We appreciate that we are viewed as the professionals with the knowhow and skills to guide our clients to success on the internet. Almost 40,000 South African businesses opted to make use of the free Google Websites branded as Woza Online in South Africa. Before software such as Kwikwap was developed for South African businesses having a website was simply out of reach of large portion of small and medium businesses which is why companies like Google offered its free website platform. The free South African version of Google Sites is closed down during May 2015 with users then being offered the alternative of listing their businesses at Google my business / previously known as Google places. Listing with Google my business / places is so simple yet so important. It is now offered as part of all our web design packages and regarding as one of the important basics when starting on an internet marketing campaign. Since 2015 untill now there has been a strong push by Google of local search results. We have experienced this first hand from our own Google my business listing. Today the question is not whether you can afford a website but whether you can afford not to have a website. Initial design and training fees for an unlimited pages website vary between R2,500 and R4,400 with monthly hosting fees averaging R165 per month. In this section I will be describing two specific You Tube videos available on the internet. Google has its own You Tube video channel and offers some very easy to understand explanation on how search works and what the most common mistakes are website owners make. These two videos covers some very important basics. It is worth watching them a few times. Google searches it's index of the web or at least as much of it as can be found. Does the page contain synonyms? If we wanted to fill these pages with words we could expand on each of the aforementioned but thats is going to be avoided. Most of these items being listed is covered in the rest of this guide and because of time constraints of our target market we want to keep the format as a guide and not a book. This guide is not meant to replace us but to help our clients understand what they could do to do well on the Internet. "Does this page include synonyms?" Google Webmasters is a free tool which allows users to see how a search engine sees your website. One such report is Content Keyword which tells you how many times a word appears in your website and how many variants is being used. Google knows that when someone is writing in a natural way they will be using words in a logical manner. Google knows when they are being spammed by website owners practising Keyword stuffing. So while we are saying that to be sure to include the right words we are not saying it is a matter of jamming in certain words and variants of it. No... Website owners should take proper care of website text and if they are not skilled they should look for affordable copy writing services and assist the person doing the writing to understand your business. What makes your business, service and products unique. This uniqueness need to be captured within the website copy. Website owners need to understand how search engines like Google works. People use websites like Google to search for information and for products and services. Google does not search the internet when returning results but searches its index of the web. Google first need to index a website before it can be returned in search results. Google indexes the web by using a program called robots or spiders and start off by fetching a few web pages and then follow the links on other web pages on those web pages and continue this process. A new website will probably not have any outside links to it and Google needs to be told about this website. Using Google Webmaster a website owner can submit their website and the website’s Sitemap to Google for consideration. Google will index a website and its individual web pages or some of the individual web pages if it meets their quality guidelines. When new web pages are added to a website it may be necessary to submit the website to Google again. Google functions like an electronic librarian with the capability to read and digest millions of pages per second. This electronic librarian has clients that come to her to find the most relevant information on a specific subject. 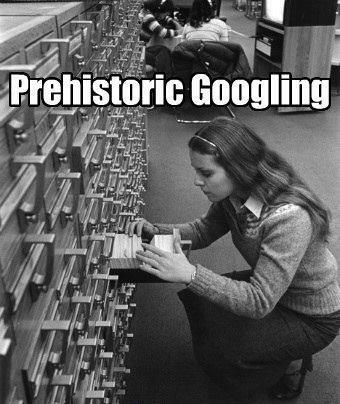 She needs to deliver good results because there are other librarians/search engines like Yahoo or Bing. Search engines are in competition with each other and they need to consistently service their clients with the best results to avoid clients switching from one librarian to another. If these librarians or search engines were to only display paid for advertisement they would function like directories and not return the best results but results which would be paid for. This guide aims to assist small and medium business owners to get their websites to appear at the top of organic search results / not paid for search results, just below the paid for advertisements. We do believe that advertising with search engines should be considered by small and medium business owners especially if their competition is doing so. This is discussed in detail in the advanced section of this guide under the section Cost concepts and Google Adwords. On the ligther side ... If more people understand how search engines operate much more attention would be paid to what matters most... Doing the basics well and paying proper attention to the content (information) provided by your website. From the outset Kwikwap has set out to be very user friendly. Most small and medium business owners web design needs will be met with the Kwikwap Software. Allthough this guide can be read by people not making use of Kwikwap software a secondary aim of this guide is to train actual clients of Kwikwap and Buddy Web Design. The ease of mastering the Kwikwap's user friendly software is perhaps what makes it stand out the most from other CMS available. On average it does not take more than two or three one hour session to train the average person on how the Kwikwap software works. It is expected that the younger generation coming trough will need about a 30 minute introduction before they are able to manage their websites. Our kids of 10 and 11 have already showed us things which they can do which we could not do. 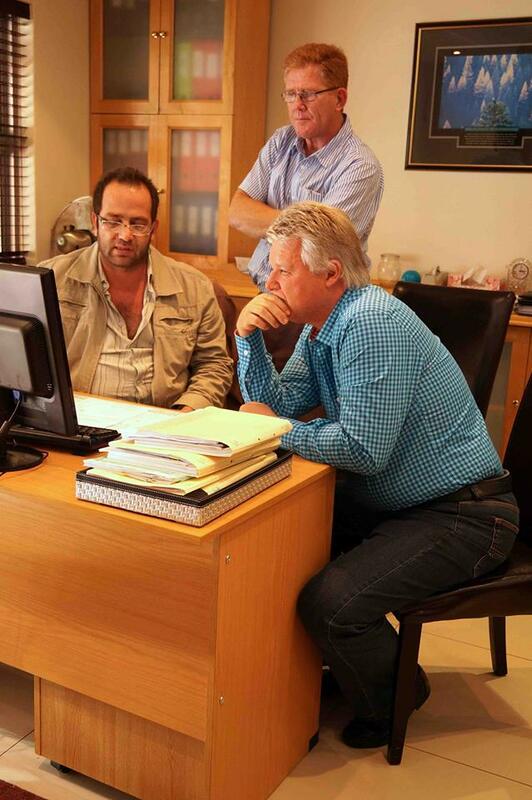 Francois Marais training a client at their place of business on how to manage the Kwikwap Software. On average no more than two sessions of +- 1 hour is needed to master the Kwikwap Software. The Kwikwap System also has an built in, easy to follow Tutorial. Even if you do not wish to manage your own website you need to understand the way search engines work, the most important basics and how to set out your website copy. If you want to do really well in search results you will need to understand the advanced web development options available. If you are scared of computers and technology Buddy Web Design will still be able to guide you along the guidelines outlined in this guide. We will often, before we start training on the CMS ask our clients to supply us with certain information for the most important pages. Even if our clients fail to further develop their websites we want our clients to at least get them some business from the internet. Quite often that is which inspires website owners to take their website development more seriously. Where clients do not want training we will do the updates but we still require the right information. Nothing is as important as doing the basics well. The basics of your website form the foundation of your website and it is important. It is nevertheless important that we as your web design company understand for what search terms you would like to be found on page 1. This newsletter is focussed on getting free generic traffic to your website. Generic is when people find your website for things other than your business name or other than paid for search results. We need to be supplied with about 15 search terms (not more than 400 characters) you would like to be found for, which describes your business. This information will be entered under settings and admin / business description. A website consists of individual web pages. Any web page can be indexed by Google. Any web page has the potential to be included in search results. But ask yourself the question? Why would Google keep this web page in its index? Is this information unique? Will it add value to the client’s of Google / your potential clients? Buddy Web Design designs websites for small and medium businesses on the South Peninsula using Kwikwap Software. We visit business owners at their place of business in areas such as Fish Hoek, Simons Town, Kalk Bay, Muizenberg, Contantia, Tokai and Bergvliet. We offer training on Kwikwap’s user friendly CMS Software. You cannot expect to be found for search terms if these words do not appear somewhere in your website text. It must be logic that the headings of individual web pages are important whether it is a product or service or a newsletter/blog or standalone custom page. The title of this newsletter could be for example changed to “Important basics for Internet Marketing” after the newsletter has been emailed. We use a title like February 2015 Newsletter seeing it affords a better chance of bypassing Email Spam Filters. When creating your website text it is important to consider your headings and especially the headings of your products and services pages. Hopefully you should by now understand that this process is not a mechanical process but a simple natural process of defining what makes your business , products and services unique and different from your competition. The more common your products and services the more effort you need to put into your whole website text. For example when developing the FAQ section of your website. Your business description ( 4.1) , the titles of your individual web pages (4.3) , your important pages (4.2) should be underpinned and substantiated by quality content which is the product of your own work and not be copied from other web pages found on the internet. Search engines ignore and even penalise websites containing duplicate content. The more in depth and quality of the information you provide the better your overall chance of your website appearing on page 1 for a variety of search results which might bring you eventual business. Always keep asking yourself is the content of this page unique and different from what is already available on the internet and especially in the area where you operate your business in. Why would Google not rank me higher than my competition? That is what you want to achieve with your basic website copy /text. A good source for FAQ’s is your email inbox and outbox where people would have asked questions in the past and been answered. A few photographs on your website in between website text will make your website look more attractive and is often a better way of explaining what you do. Search engines mainly work with website text but we must remember we work with humans, our potential clients. Photographs are a way of breaking the monotony of reading trough website text. You can have many different albums with hundreds of photographs in your website but please remember that people entertain themselves via Face book and Instagram when they want to look at pictures. It is better to use fewer more quality photographs and use the photographs as an opportunity to create original website copy by describing the photographs which are included in your website. Here is a Youtube video which I did more than 5 years ago explaining what we do. It is good to note that we have been consisitent in our approach and what we have been preaching. This video on its own could bring me in business. The fact that this You Tube video is linked to our business website assists with our websites SEO. It forms part of off site SEO. It will benefit you if you choose a domain name that includes what you do like we did with Buddy Web Design. It will also benefit you when you choose a domain name that includes the town or city where your offer your services like www.capetownfabrics.co.za . Having said this none of the clever tricks will work if the whole website is not of a good quality. Google continues to figure out how to weed out lazy and spammy website owners from search results. It is also important to try and register a domain which can easily be remembered and spelled. It is easy when we casually meet strangers who might be a potential client to tell them look up Buddy Web Design. Same with our Facebook page. The address is facebook.com/buddywebdesign . The aim of the website marketing guide is not to replace the web designer but to guide small business owners in understanding Internet Marketing. Our typical clients choose how involved they want to become with advanced website development. We are guided by the wishes of our clients. Google's free resources are easy to understand. Google has since it's creation strived to broaden it's possible client base and have been actively involved with free resources such as Google Sitebuilder, later rebranded to Woza Online to introduce smaller businesses to the world of online marketing. Google will always offer free resources and services together with the option of fast tracking Internet Marketing by making use of Google's advertising options. Woza online has recently closed down and users advised to make use of the free Google My Business platform. It is foolish for any small , medium or large business to ignore these free resources from Google. It is quick to register and simple to understand. We often include registration with these free resources when quoting on a new web design and development project. You will notice that Google Webmaster not only shows you when people clicked on your website but also important information like the number of impressions for certain search terms, the CTR (Click trough rate) . Importantly it shows you the psoition for certain key words. By using Google Webmaster you will have a clear understanding of here your website lies with respect to specific keywords. Google Webmaster is easy to understand. We can assist you to register and co manage your Google Webmaster account for you. Besides registering your business with Google my business/places we register your website with Google Webmaster and submit your website’s sitemap to Google. This ensures that new websites are found and if the individual web pages meet Google’s quality guidelines that these pages are indexed by Google. Think of Google as an electronic librarian who will only keep (index) those pages that add value to the internet. Google Webmaster will allow you to see the way which Google sees your website so you can proactively make changes to your website text. This guide is written for small and medium business and when we deal with Social Media marketing we address small and medium businesses. We, ourselves have gotten a lot of business via Face book without having to pay for it. There was a time where we enjoyed Face book. This is a pre requisite when doing marketing via Face book. A lot of small business owners trade as sole proprietors and individuals on facebook generally open a Face book profile. I have seen that many people who are individuals and who are passionate about their work also share their work on Face book like we would share a website we have created or where an installer of floors would share a perfect floor which they have installed. Quite often without even realising it and without having a business page people are using Social Media to market their business. We have now dealth with personal profiles which could be used to market your business. On Facebook you can also create groups and personal business pages. Facebook will allow some free advertising but they also need to generate advertising revenue so in the end you are expected to pay if you expect to use Face book for your business. There are ways to increase organic shares and likes of your Face book pages. We will deal with a few examples of successful Face book marketing for small and medium businesses. Big corporates have the budgets and are concerned with thinsg like brand image and consumer relationships. For most small and medium business owners its more about getting new clients and selling more products and services. When Face book and Twitter is properly understood it can be used as an effective tool to market your small business services. But maybe more importantly it needs to be understood that not all the people who like your business page will be able to see the page posts. You may be able to gather a 1,000 likes but only 5% of the people who like your page will see what you post / be reminded of your services. Some of the 5% may already be a client while some will in any event never make use of your services. You could be speaking to a dead duck every time you post something on Face book. It is important to rather first blog or for example ad a product special to your website before posting the information on your website to Face book. Your website might be returned years later when someone searches the internet via a search engine while what you post on Face book is quickly forgotten. Having Face book Pages and Twitter accounts can be good for your website’s ranking as it is a signal to search engines that you are a bona fide active business.Be careful with the time spend on Face book and realistic about your potential reach when not considering to advertise on Face book. Face book advertising should not be ignored as you can be very specific on the demographics of the target audience who receives your advertisements. Francois Marais and Melanie Scoeman of Buddy Web Design have both met people online trough their personal facebook profiles and sold websites because of these online relationships. Buddy Web Design does have a Facebook business page. The real value of the business facebook page will be unlocked when the business page is advertised to a selected local audience. We will for example target our campaign at people over 35 who owns their own businesses and who live in Cape Town. That's the major advantage of advertising on Face book. You can be very specific on the demographis you wish to target. This is an open facebook group of which Francois is the administrator of the group. Anybody can post about property in Marloth Park but posts are limited to property. This makes this group a very useful resource. This Facebook group is backed by the website www.marlothparkproperty.co.za . As web designers we have met people online who operate in Marloth Park and have sold websites to people more than 1,600 km away. We have also teamed up with a local estate agent whom we have given exclusive rights to list properties on the website. Even though the group is free and everybody can post or list on the website as webmasters and admin of the groups we are often first contacted about holiday accommodation, or property related matters and we are in process of turning our website into a profitable website. We are also notices as web designers by our Facebook activity. By starting early and building a group on a certain town or city the administrator of Facebook groups do get an edge on marketing opportunities which may arise. The reason we include this chapter about alternatives to internet marketing in an internet marketing guide is because we find many new clients who are unrealistic on what can be achieved with a new website. From time to time we find people wanting us to design them a fully automated e commerce website which would require no further work but would result in the money rolling into the bank without the website owner having to anything further. If only life could be that easy. Before expexting a return on any investment the investment first needs to be made. With Buddy Web Design and Kwikwap the initial design and training fees often become miniscule when compared to the time which is required from the business owner to fully develop his website. The forces of a free market economy will always reward investments proportionate to the size of an investment. We have seen people who have spend in excess of R100,000 on a website without seeing any return on their investment. The most common mistake people make when thinking they can make money out of the internet is to build directories thinking they can provide a better service than search engines like Google. We will deal with directories in the next chapter. Small and business owners need to take a realistic view on what new business they can fairly expect to gain via their business website. We have seen and been part of many success stories as well. Just as it is foolish not to market your business via the internet it can be very costly to only rely or place too high a reliance on what you can achieve via an internet marketing campaign. It will cost you your time to sit down and write good website copy. For any small business owner time is also money. Time/money which could be spend marketing the business via other means e.g. cold calling , newspaper adverts , prospecting for leads from existing customers , business lunch with an important client . Sitting down once and doing a proper job with your website could bring in business for years to come but if possible the website should be kept up to date with at least a monthly newsletter if possible, new references and testimonials being added. If the work is done properly the monthly update should not take much time and it should be possible to do it as part of your monthly business routine. The monthly newsletter of Buddy Web Design is a good example. We are creating good, quality content. We sometimes edited our monthly newsletter and submit it as a freelance newspaper article where I could get some free publicity and possibly a link back to our website. We also use our newsletter to stay in touch with potential clients via the free mailing list facility provided by Kwikwap. Our newsletters are also shared on Face book groups and sometimes creates immediate awareness. We have made developing our website part of our normal monthly routine. Few industries are as competitive as web design when it comes to getting business via Internet marketing so we ourselves still have to resort to other means to market our business services. We would definitely be out of business if we only relied on our business website to bring us new business. All businesses should consider listing on free or paid for directories as well as advertising with search engines. Certain businesses almost have no choice but to advertise with established directories or search engines e.g. Guest Houses in Cape Town or if you are a new Plumber who has recently moved down from Johannesburg with no established contacts. The most popular tourism related websites are Safair Now, Where to stay and newcommer Lekkerslaap. Even individuals have the opportunity of building a successful directory but normally when it is focussed on a specific town. A good local example is www.simonstown.com . Guesthouse owners in Simons Town simply can not afford to not advertise with a few of these directories. There is simply too much competition on the internet and large directories like Safari Now employ a few professional scriptwriters. Even if you do register with these directories you still need to have your own websites. Quite often people find an establishment trough these directories and then follow the link to the establishments website or do a search to find the establishment. When people are looking for accommodation they want a quick answer on availability. People first look for accommodation when planning a holiday. Just about every second website of a Guesthouse will list restaurants and attractions in the area. If this is being done to attract website traffic then it is not a good idea because by then people have probably allready made their booking. You will do better by putting out information on travelling to South Africa on your website. You might attract traffic of people who have yet to book their accommodation. A very popular and well know free directory, with advertising (top spot) options is Gumtree. A lot of people advertise on Gumtree for free. The problem is that you have to keep on repeating your posts and even if people find your listing they will want to know but where is your business website? It is important that one understands that advertising will get you clients and income which you would otherwise never have had. If the Gross Income is more than the advertising expense then it is foolish not to advertise. It is reasonably easy to calculate the costs and benefits of such marketing campaigns. But even if you list with these directories you should still have your own website since people prefer dealing directly with the owner of an establishment so that they might get a better price and an immediate answer about availability and questions they might have. They might find your business on a directory but often follow with a direct search for your business name. Listing with established directories or advertising on search engines can guarantee immediate business for a new start up. These costs should be part of the budget for any new start up. To find out which directories you should register with is simple. Google for a few search terms that you would like to be found for. Study both the paid for and the organic search results. You will notice which directories regularly appear at the top of page 1 of Google. An important factor search engines uses when determining page rank is to ask how many websites, also considering the quality of the websites, link to your website. Link building should be a natural process and the low quality link building schemes should be avoided at all cost. Consider your loyal suppliers, clients and associates and ask if they would link to your website in an effort to boost your website’s ranking. As web designers operating in the Southern Suburbs we will for example seek link exchanges with local print magazines websites, local printing shops and other advertising agencies. We are happy to include links of established and local businesses which relate to our line of work on our website. You can also buy links by advertising on directories. You can have free links from your Face book page and your Google my business / places page to your website. All these links are considered by search engines when determining page rank. Has my website been submitted to Google? Have word’s been included for which we would like to be found for? Does all the links work on my website and is important information easily accessible in text format and not as part of an image? Do we deserve to be on page 1 of Google? Are we unique and original enough? Has careful consideration been given to page headings / titles? How will we keep the website up to date and the content fresh? Will other websites want to link to my website? Can I confidently ask suppliers and clients or associates to link to my website? The launch of your website should be viewed as a good start but definitely not the end of your internet marketing campaign. Get a realistic benchmark and study the websites of your competition, those you plan to overtake in rankings. Steal ideas with your eyes but do not copy text. We will assist where we see an opportunity to bring something new to the market in terms of information. We cannot over emphasize the importance of doing the basics well. Having done the basics well what is left for a small medium business owner to do? That is the topic of this section of our Website Marketing Guide. Larger companies have in house web developers and designated people responsible for social media marketing. Smaller and medium businesses often cannot afford to employ an in house web designer or dedicated social media campaigner. Those who do often find that the cost by far exceed the benefit from such marketing activities. Or does it? The problem often is that the benefits of internet marketing versus the costs of such campaigns, whether it is trough your website, a directory listing or trough social media marketing, is difficult to calculate. The first section of this guide covered the basics of Internet Marketing. In this section we will be expanding on some of the important basics and discuss some new sections which can be added to your business website. We deal with a wide variety of businesses and we simply cannot cover each possible section to be added to a website. We at Buddy Web Design can assist with determining which sections need to be added to your business website. By studying your competition, simply by using Google search you should be able to get a fair idea of what information needs to be included on your business website. Any form of Marketing will cost you money. Whether directly or indirectly, marketing will cost you money. The goal is allways to make more money than what the cost of advertising is. There should be a direct relationship between the money invested directly or indirectly in marketing and growth in sales. It follows that business owners need to understand these relationships in order to effectively manage these expenses or investments. We are asking you, our current and potential clients, to spend time on your website. We are asking you to spend time reading this newsletter. We know and understand that time is valuable for any small or medium business owner. We all would like to have more time or money to do the things we would like to do or do the things we know we should do. Hopefully you realise the value of having an informative website which brings in business or which enhances the professional image of a business. Small and medium business owners should view time as equal to money. Times spend away from doing your work and invoicing your clients / customers is costing you money. When a small or medium business owner goes on holiday it is costing him more than the actual money spend whilst on holiday. This view of time = money is also called the opportunity cost of time. When spending time on marketing, such as developing your website you are also spending time away from invoicing your clients / doing the actual work. The problem for many small / medium business owners is that they need more work in the first place. Without sales and marketing there will be no goods to be produced or services to be invoiced. A website can actually save you time and thus save you money if the information on the website is up to date and covers the most important basics of your business. Our own website saves us a lot of time. We often simply refer people we meet on the street to our business website where they can view examples of our work, view our pricing guidelines and see what we do and what makes us unique. We find a lot of small and medium business owners postponing the implementation of their website due to a lack of time. They are actually postponing because of a lack of money. It is the same thing. Money can buy any small and medium business owner time which will afford him the opportunity to source more profitable deals or spend important time strategizing the further development and improvement of their business. A website which brings in more work should assist in achieving this ideal situation for a small / medium business owner. Business owners need to understand the concepts of Gross Profit and Relevant Costs when determining how much to budget on monthly advertising and marketing. It can reasonably be expected that advertising with Google Ad Words and other directories will be considered by all serious small and medium business website owners. Advertising with Google Ad Words is the only guarantee of appearing in search results. If your competition can afford to advertise with Google they must be making money from it and so should you consider doing. Let’s take a look at the income statement of a guesthouse before and after spending money on advertising and marketing. The above example is a very simple example. In certain circumstances a business may need to employ another employee and thus increase fixed expenses. The purpose of this newsletter is not to confuse you with complicated accounting terminology but certain basics need to be understood especially when considering advanced internet marketing. In this example before spending money on advertising the Guest house was averaging a monthly turnover of R10,000. After spending money on various forms of advertising the average turnover increased to R50,000. The variable costs of the Guesthouse increased proportionately. Variable costs are costs which increase in direct relation to turnover. In the case of a Guesthouse it would be costs such as Electricity, Food and Laundry expenses. In this simple example the variable costs are 20% of turnover. It follows that the gross profit percentage would be 80% of turnover. We see that the increase in the average monthly advertising and marketing spend has lead to an increase in gross profits from R8, 000 to R30,000. In this example the fixed expenses such as the salaries and bond repayment remains the same. These expenses are not dependent on the turnover but are fixed. You can also say that the amounts spend on advertising and the monthly revenue does not influence these expenses. The amount spend on variable expenses as well as advertising will not influence fixed expenses. We can say with regard to the variable and advertising expenses that the fixed expenses or monthly overheads are irrelevant. What is very relevant is the fact that without spending money on advertising and marketing the turnover and resulting gross profit will not increase. It is very relevant to realise that spending money on advertising and marketing will lead to revenue which would otherwise never have existed. The importance of this realisation lies in the fact that money need to be reinvested into advertising and marketing. If this is done in a disciplined way it follows that in this example R11, 000 needs to be laid out once. The money which is laid out in subsequent months would never have existed in the first place had the original R11, 000 not been spend on advertising and marketing. By doing this and realising that the Goose which lays the golden egg is your advertising budget and needs to be fed continuously you are actually only investing once in your monthly advertising budget. If you spend R3, 000 per month on your Google Ad Words account and it brings you in business which you would not have had your actual expense or investment is a once off R3,000 and not 12 x R3,000 to argue that your annual advertising budget is R36, 000. Your making a fatal error by not admitting that you are receiving income directly because of money spend on advertising. We are web designers and obviously believe in websites as useful tools to bring in new business but at the same time we are the first to admit that a website will not replace all your sales and marketing activities. No business can exist without sales and marketing. What we are saying is that if your website and your advertising expenses are bringing you in new business then you should firstly reinvest the additional income to fund these marketing efforts before directing money to other avenues. Exactly the time can be said with spending time on the content of your website. If it brings you in new business then it should be logical that you should spend more time on new content. We have seen many times that this is what happens once website owners start realising that their efforts have brought them new business. Yes it is the effort of the website owner and not the effort of the web designer which brings in the business at the end of the day. Once you have covered the basics well you should definitely consider advertising your website with Google. Hopefully in the preceding paragraphs we have explained why money should be spend on advertising and that the monthly expense should be viewed as a once off investment because further payments will be funded via income which would not have existed in the first place had money not been spend on advertising. We have in house specialist who could assist with setting up and running your Google Ad Words campaign. Google Ad Words works on a bidding system where website owners bid for certain key words or phrases. The highest bidder gets to be displayed at the top of search result pages. Google Adwords costs money. Time is money. Stop spending time on sales and marketing and your production will slow down. Even if you are busy now one should never stop your sales and marketing activities. A client with a low profit margin can be replaced with a client gained with a higher profit margin. We will be the first to admit that accurately calculating and analysing these exact costs and benefits from Google Ad Words or the cost of the time spend on your website will be an almost too impossible task for the average small medium business owner. It is however important to note that quite often the benefits of finding a new client or a return customer cannot be measured in the month in which the client was acquired. Often the benefits of a happy customer results in continuing financial benefit in the form of return business and referrals by the happy customer. That is too be viewed as Goodwill. Goodwill is an intangible asset which sometimes can be included in the determining of the sale price of a small medium business so it should definitely be viewed as an asset. A lot has been said, and will be said, on attracting website traffic via good quality content on your website. Very little has been said so far on actual design issues, the look and feel of your website. The reason simply is that an attractive website means nothing if it does not get website visitors. A lot of web design projects miss the mark because too much emphasis is placed on the look of the website and not enough attention is given to the content of the website which will attract the visitors. We have in house specialist graphic designers who can deliver a professional custom design from R700. Our portfolio section on our website will give you a pretty fair idea of what quality designs can be expected by our in house design team. The look and feel of the website can be changed as often as you like. You can even attempt to do it yourself. The functionality is built into the system. But we prefer that you make use of the in house specialists to ensure a professional look. Our designs are often guided by the current Logo’s of businesses or in the case of a restaurant by the current menus as this obviously reflect the corporate image which wants to be projected. We are guided by our clients as to the exact look and feel they want for their website. We can achieve almost any desired look using CSS (Cascading Style Sheets) and HTML 5 manipulation. You can even incorporate certain flash and animation into your website. But it is important to note that not all devices can read flash and that even though search engines have the capabilities to read flash and text embedded in images these technologies are not today employed by search engines because it requires too much energy. It takes time, and thus costs money, to design these fancy flash animations. You probably would be better off spending your time or paying a script writer than to allocate resources to fancy design issues which will bring in no extra traffic. After attracting website visitors to your attractive website you need to convert the website visitor into a client. You need the website visitor to either proceed or buy now, to leave their contact details or for them to request a quote. Having these options available on your website is called having a call to an action. This call to action should be found across all your important pages which will attract the most traffic. The call to action will round off the web design process. Below you will find an example of a Call to an action. Normally it would be hyperlinked to a request a quote form. We will now discuss some more advanced website development techniques and more specifically things you can do on your website which will attract more website visitors via search engines. This is also known as On Site Search Engine Optimisation. Firstly we have user friendly software like Kwikwap, backed by a skilled technical team which enables business owners to be in charge of the content and development of their websites at a fraction of what it used to cost. Secondly search engines like Google are improving day by day and are better equipped to separate the wheat from the chuff. In other words search engines like Google are able to provide their clients, people who search for information, products and services more relevant to their needs. It is becoming more and more difficult to spam or fool search engines. Both these aforementioned trends are set to continue and the question should be asked what should we do? First do the basics well and secondly keep on focusing on providing useful and relevant content to your potential clients. Content should simply be viewed as information which clearly defines who you are, where you are and what makes your service offering unique. We are all unique individuals and by simply getting a website in the first place you should get some website traffic to your website. The more common or competitive the industry, in terms of internet marketing, the more work need to be done to get a piece of the pie. Whether you are a builder, a web designer, business coach or accountant people usually want to know who you have done work for and want to view examples of work done, if possible. Kwikwap has a nice interactive testimonials module which can be activated at the click of a button. Interactive means that people can add their testimonials via your website. You have the option to decide whether or not to include new testimonials to your website. It can be very risky to allow any person to add content to your website without you be able to moderate such comments. You Tube is a very popular free service offered by Google. Anyone with a Google Account can have a channel and upload videos to the internet. These videos could be set to be public and can be in itself be valuable marketing material. You Tube videos are included in search results. You can get exposure without even having a website. It is important to link your You Tube videos or your You Tube channel to your business website address. As with your Google my business account these are indicators to Google that you are an active bona fide business. Advances in technology have made owning a quality video camera affordable. Advances in technology have made having a website just as affordable. The real question you need to ask is can I afford not to have a website? It is obvious that the answer is no. It should also be obvious that every small business in future will probably have a website. The next question will be: “What are you going to be doing on your website better than your competition?” Videos can be one thing. It is ideal for product demonstrations which require some technical explanation. Kwikwap has a nice Video module which makes it possible to neatly sort You Tube videos into different categories on your website. More images can be inserted in between website text to present the message or information better. When you, like us, enjoy writing it an image can break the monotony of endless paragraphs of website text and assist to explain what message you are trying to convey. For those who want to do it themselves we include in our training how to insert tables in the background and how to insert images, resize them and how to do the layout of your web pages within the content editor. Photo galleries are popular among website owners. As mentioned during the basics photographs provide the ideal opportunity to better describe your business and services. It is easy when stumped with your website copy to simply describe what is happening on a photograph. Remember rather have fewer but quality photographs which are properly described with website text than to have hundreds of photographs. People are busy and are already entertained with photographs via Face book , Instagram , Pintrest , Flickr or Picassa. Another important point to remember it is better to add interesting information and images to your website and then to share it on Face book or twitter. In general, if indexed at all by search engines the information shared on Social Media is not indexed for a long time while information on your website could be indexed for a very long time. Francois Marais presenting Kwikwap Group Training sessions in Pretoria. It still is exiting to get a group of business owners together who have become their own webmasters. The popularity of these group training sessions is what motivates us to continue offering the best value web design services, enabling the average man on the street to become an Internet Marketer. Some people have commented that we write too much on our monthly newsletter. We know that our target market, small and medium business owners, do not have unlimited amounts of money / time and that the people on our mailing list will not all read our newsletter when it lands in their email inbox. But our real target market in the long run is serious business owners who want to have a strong visibility on page 1 of search engines like Google. You need to be practical about what you ad and keep up to date on your website. Showcasing your current and latest work on a monthly basis can be a very practical way of keeping your website fresh and live with new content. Remember, as with your references/testimonials, - section of your website to include a description of what service you did in which area alongside the names. For example yesterday I did a website for Redhouse Maintenance in Betty’s Bay. I will mention Betty’s Bay and CMS Website + Training on my website in the section current and latest work. Not only will this potentially bring in business in future but it will also tell my potential clients what kind of work they can expect from us. If people can gather from your website what you do and what kind of work you deliver then it can save you time in the future as well. I often meet people and i can simply refer them to my website. It is easy to remember Buddy Web Design. I often see in my search results that is what people searched for. I no longer need to give long explanations as to what we do and what kind of work can be expected. Than function is now in part performed by my website. In the end the time invested on a monthly basis on my website ends up saving me time in future. Showcasing current and latest work is thus a practical way of developing your website and keeping it up to date. A forum on your website could get people returning to your website. The business Outdoor Photo owns it existence to a popular forum which existed before the business was formed. People are spending huge amounts of time on Face book taking part in various discussions. It is difficult but not impossible for some businesses to get an active forum going on their website where a specific industry is discussed. If you have a popular Face book page or Group then chances are you could also have a successful forum on your website. The forum discussions forms part of the website text which is indexed by search engines. You can have up to 17 custom pages on your website. 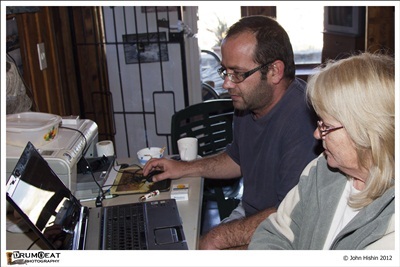 An example of a custom page on our own website is “Southern Cape Clients”. That page is where we list our Southern Cape Web Design clients. A website consists of individual web pages. Not all web pages which are submitted to Google are indexed but only those meeting the quality guidelines of Google. Pages with no original or meaningful content are ignored for example pages with one liners. Each page on your website has the opportunity to be indexed. Each page heading should be carefully considered. In this example we wanted to be found for the search term “Southern Cape Web Design” because that is where we do the bulk of our web design. It will be nice to be found for the search term Cape Web Design but the competition is fierce. No other web design company blog as much as we do or we have yet to come across other web designers with as much content as we have on our own website. But we do get business from our own website. By continuously working on our own website we are being found for more and more search terms. Probably the main reason we ourselves are not found at the top of page 1 for search terms like “Cape Town Web Design” is because other web designers have more inbound links from other important websites linking to their websites. We have started to meet with local businesses in the advertising and printing industry which is relevant to what we do and to ask for link exchanges where we mutually link to each other websites. Should your website be professional and informative other websites will naturally link to your website. For the bulk of small and medium businesses this is not going to happen. Beware and stay clear off unnatural link building schemes. Google actively penalises websites taking part in these link building schemes and have the technology to pick up on unnatural link building. Restaurants and Guesthouses in certain geographical areas should naturally link to each other pretty much in the same way as these type of businesses leave there brochures at each others place of business. Should you be a guest house or a restaurant and say a cage diving operator wants to leave his brochures at your business it would be fair to ask them to include a link to your website. The future looks bright for professional website copy writers. Not everyone has the talent or time to write perfect English. Website copy writers can assist those people who are really stumped. We have recently asked a professional copy writer to assist us with our home page and our about us page, two of the most important pages of our website. We will first do our best to rewrite these pages and then ask the professional copy writer to proof read and suggest edits to these pages. The challenge is that we need to use words which people use in everyday language and will use when searching for web design services on the internet. We will be stupid to use high level English when it is not the way people speak or what people will type in the search bar when searching for our services. An example is a client of ours who runs a drug rehabilitation centre in Cape Town. He has an excellent command of the English language. I had to convince him to use words like drug rehab alongside words like drug intervention and treatment centre. We believe websites which are focussed on specific topics do better than websites which are more general in nature. For example a small handy man business might offer plumbing, electrical and painting services. In general the websites of a plumber, electrician or painter which is focussed on their core services will do better than the handyman who offers a variety of services when someone searches for plumbing, electrical or painting services. This will not be the case when someone actually searches for a handyman. After having established the basics of your website consideration could be given to providing information which might attract website traffic which could lead to business. A practical example would be for a web design company to list the printing shops which does business cards and pamphlets in the area in which they operate on their website. People searching the internet for a local printing company might consider making use of the web design company when they find a list of local printing companies to assist with printing of marketing material. See for example this section on our website: Printing and Advertising Peninsula . When small medium business owners earch for printing companies or advertising companies we are hoping that they can find this information on our website. We are also in the advertising industry and maybe someone looking for a printer or newspaper for advertising options will also consider our web design services. You can test our examples by doing a few searches. Eg Penisnula Printing Companies, Southern Subburbs Cape Town printing companies . It works. Another example would be for a guesthouse to write about the attraction of the area. This is where website owners should take a realistic look at the current information available on the internet. The tourism industry specifically is overrun with directory websites run by companies who employ several professional copywriters. If you own a Guesthouse in Simonstown and you start writing of the penguins of Boulders beach or the Whales which come to visit annually you will do well to realise that you are not going to attract website visitors simply because the topic has been covered to death already. If however you provide the information in a different language you could get the results you are looking for. If you go and do in depth research of the Penguins of Boulders beach, gather new and fresh information you might get website traffic. But what traffic? You will get traffic for people wanting to know more about the Penguins of Boulders beach but not necessary website traffic of people wishing to book accommodation. One has to be very careful about misspending time when creating content for your website. Time which could be rather spent providing information directly related to your business services. One should consider attracting potential clients via indirect traffic only once you have done the copy writing basics of your business and services well. You will do well to research the current available information before embarking on adding to the topic in an effort to attract more traffic to your website. The research could simply be done by searching for the topic via search engines. The software we use from Kwikwap has advanced modules or features which can be activated at the click of a button. Ecommerce is available at the click of a button with links to the most current and popular third party payment gateways. (Pay U, Paypal, Payfast). All our websites are designed responsively. More than 50% of searches happen via mobile devices or smart phones. Our software has an easy to use mobile website design tools. It takes a few minutes to custom design the mobile version of your website. Kwikwap have also developed Industry Specific Modules. It is modules which are only used by specific industries. By writing and distributing a monthly newsletter we keep in touch with potential clients. We are also creating content which hopefully will be useful for small and medium business owners. At the same time we hope that these newsletters will assist our current clients to develop their websites in a manner that brings them in new business, enhances their public image or saves them time. Hopefully all three objectives are achieved. Monthly newsletters are popular among sport clubs and schools. It is difficult to write about something as dull as web design but for us it is not dull because websites and web design are our passion. Our real passion is seeing small and medium business owners achieving success on the internet. We are often asked how to get a website on page 1 of Google. At the moment the word count of this newsletter is standing at 7,000 + words and growing. Unfortunately you need to read this newsletter and our other newsletters to gain an understanding on exactly how this is achieved. We also thus use our newsletter/blog as training material. The difference between a newsletter and a blog is that a newsletter actually gets distributed to a mailing list while a blog entry only get’s posted to a blog or website. We believe that a blog should be part of your company website as it could attract traffic to your website. Information on the internet is not always indexed by search engines. Often you need to submit a sitemap to search engines to get the process going. Search engines uses software programs called robots to crawl the internet by following links on websites and following the links on those subsequent websites. If you start a new website or blog no other outside websites will have linked to your websites and search engines like Google might never find your website or blog. Very few stand alone blogs appear in search results according to our experience. An important section on your business website could be the section on specials and promotions. The Kwikwap software has a very nice specials module which allows you to set a start and end date for specials on your products and services. A lot of people search for specials on the internet whether it is a special offer on discounted furniture or whether it is a web design special. It follows that one should have continuous special of some sort on your website as this might bring you more traffic. Groupon is a popular concept where amazing specials are offered. Some of our restaurant clients have had successful marketing campaigns using Groupon. The actual deal is done at cost or below cost but the idea is that it brings in new clients / goodwill – people who would have never visited were it not for the Groupon special. We have noticed in practise that often some of these Groupon clients are the stingiest of the lot and often only come only for the special whilst only ordering free tap water with the meal offered on special. As with other marketing expenses the real value of these Groupon expenses are difficult to quantify as one never knows when a return customer has been won. Special days are days like Mothers Day, Valentine’s Day, Fathers Day and Christmas Day. Normally these days are very popular already and businesses like restaurants have little trouble of filling their dining rooms on these days. The advantage of marketing on these days is that it will allow you to increase your asking price and still have a sell out on these dates. You need to realise that it takes time to index individual web pages and to present them to users of search engines. It follows that website owners should pre-empt these important days and start adding them well in advance on their websites. It would even be better to have permanent pages on these days as part of your website. Our latest two clients were a driving school and a paint contractor. Using them as an example what would consist good content or what would be a good idea for a web page which forms part of their website. For the driving school it would be to describe the K53 test in detail. What does the K53 test entail the test which takes place inside the yard as well as the road test? Service providers like a driving school should avoid making the mistake thinking that this information is common knowledge. It might be common for them and their students they meet and talk to every day but somewhere out there is a potential client who knows nothing about the K53 test and who would like to read up on it. It will do them well, the driving school to research what information is available and for them to decide whether they can better describe the K53 test. Even if they cannot come up with the best description they might be able to come up with the second or third best description using their own approach and viewpoint and end up being on page 1 of Google even though it may be in the second or third position. For the paint contractor it would be to showcase what makes their service offering better. Whilst training yesterday the business owner proudly showed me his standard of work as opposed to the general standard of work. He showed me before and after photographs on his smart phone and explained how they pay attention to detail and why he views himself as the best painter out there. I often see that business owners can talk about what makes their service offering unique or better. The challenge and the opportunity is for the business owner to take that same information and present it in written format with the same pictures on his website, those conversations which happens naturally on a daily basis when business owners become passionate about their products or services. His passion on the subject of finishes could be a standalone blog entry or custom page entitled “Paint finishes- how it should be done”. More and more business owners will get access to user friendly CMS software and the next generation is already probably more aware of Google and technology. The playing fields are to be level. Extra effort need to go into your Website Copy as to stay one ahead of the competition. This is even more important when bearing in mind the priority search engines give to established older websites. Unless a new website really offers better or unique information the older website will always have preference in search results. We at Buddy Web Design can assist with ideas to generate good content always starting with doing the basics well first. Remember to study the websites of your competition and ask yourself on how you are going to beat them with more relevant, comprehensive and fresher content. You will be setting a realistic benchmark and stop playing a guessing game. The most common widgets or plug-ins which can be added to websites are Face Book like boxes such as on the Home page of Buddy Web Design. You need a Face Book Business Page before you can get the code to insert a Like Box on your website. Only consider this if you are active on Face Book and have a business page. (Groups and individual profiles do not yet offer the opportunity to install a Like Box). People who enjoy Face book will tend to like your business page and may use the platform to enquire about your products and services. By having a Social Media presence you may enhance your websites ranking on search engines. It is one of the 200 + indicators which search engines use to determine the importance of a website. Other plug-ins includes twitter feed, Currency converters, Trip Advisor widgets as well as virtual tours. See the home page of the Brass Bell for example. (www.brassbell.co.za).The addition of these widgets and plug-ins are done easily and is usually done by ourselves. We do the once off more difficult things for our clients while we expect our clients to work hard on the easy routine content of websites. Forms and surveys - Getting valuable , sometimes anonomous feedback which is less harmful than Hello Peter or Trip Advisor. The addition of live plug-ins creates an interactive feel and makes the website look more interesting. One should be wary of focusing on these nice to have goodies and neglecting the important basic sections of your website. Do the basics well first. Your web designer will remain an important component of your web development program. It is advisable to schedule future appointments like you would schedule an annual appointment with your dentist or tax consultant. We will discuss the future appointments with our clients when we do the onsite training with them. The combined February and March newsletter is quite a bit to read. We hope to achieve trough them and our website that our potential clients have a good understanding of search engines and understand what we offer at the quoted prices. Our web design prices for an unlimited pages website which can easily be managed via user friendly CMS is relatively very cheap. We can only offer this because we share in the monthly hosting revenues which are compulsory with your Kwikwap website. One of the reasons we train our clients properly on how search works are that clients who follow our guidelines properly tend to achieve better results and stay longer. In that sense our needs and those of our clients are perfectly aligned. Once you have your website and have received your training Google results will be in your hands. We will provide and continue developing the best technical structure and user friendly software but your website will only be as good as the content found within individual web pages. Rewrite the home page and the about us page. These pages are very important to us. We have agreed with a local copy writer to do some SEO work in exchange for her to proof read our home page and about us text. It will do most website owners good to consider at some stage to make use of a professional writer to proof read your website copy. Rewrite of our services pages. We will take a critical look at our services pages because it is also very important. Our services can be classified into 3 different web design packages. Our important key word is web design packages. We might do better to use a single custom page to describe our three different product offerings or web design packages. At the end of the day we need to ensure that those people who do find our website find the information which they are looking for quickly and that the information is easy to understand. It is easy to fall into the trap of writing for search engines thereby frustrating the actual humans who try and read your website copy. We are going to embark on a project to liaise with all the major printing and advertising companies in our area of business and add links to their websites on our website. We have already started to meet with certain printing businesses as they are possibly a rich source of new business leads. We hope that some of these businesses also add links on their websites to ours. It is not that we expect direct traffic from these links but that we hope to increase our page rank with Google. Linking to other websites does improve your own websites ranking in search engines. We assist people with advertising and marketing trough Kwikwap Software. It makes sense and is for the benefit of our users that we link to Kwikwap as well as printing and advertising companies. We might even take it a step further and do a proper mini directory of printers in the area. It could be of value to us as people looking to print brochures and business cards are often at the start up of a business venture and might be in the market for a website. A mini directory of accountants in our area of business could achieve similar results. We will also remove outdated information and ensure that the real relevant information like the monthly hosting is visible and clear when our product offering is explained and that our website does not become too cluttered. And lastly we will ask our friends and colleagues in the industry for their comments and suggestions. We trust that this month’s newsletter helps to demystify web design, SEO and what it takes to get to the top.